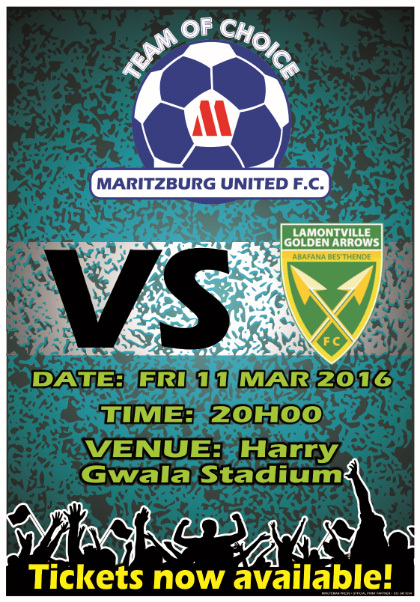 The 1st KZN Derby of the 2015 / 2016 Season takes place this Friday night, 11th March 2016 as the Team of Choice are set to welcome Golden Arrows to the Harry Gwala Stadium. Kick-off is at 20h00. The teams were scheduled to meet earlier in the new year for the first time this season, however the fixture was postponed due to the untimely loss of United midfielder Mondli Cele in a car accident. With both KZN teams progressing to the Last 16 of the Nedbank Cup in their last fixtures, this fixture will be crucial for the both teams as they seek all 3 points together with the bragging rights associated with being victorious in the Derby.